A man's belt is not just for holding up trousers, a great belt can be used to make a style statement or add a personal touch to formal wear. A belt creates a clear distinction between your top and bottom half tying an outfit together. A general rule that most men know is to match your belt and shoes and if your pants have belt loops, wear a belt. In order to make the very most out of this classic accessory, your choice of belt should reflect your personality and compliment whatever you’re wearing. A belt is essentially a mid-sectioning line that cuts your body into two halves, creating a shortening visual effect. If want to look taller, make sure to match your belt with either your trousers or your shirt making the ‘line’ less pronounced. If you are a taller man and are looking to break up your vertical line, complementary colors or clashing hues work well, so you can take advantage of colored belts or detailed styles. The belt size number corresponds to the length in inches or centimeters of the tour of the strap, measured from the buckle to the mid hole where it should be fastened, allowing for slightly higher or lower waist trousers and allows for the variations in waist circumference everyone experiences. Your formal belt for tailored trousers and suits should be completely understated. It should be made of fine leather and come in brown, black or a very subtle color and between 2.5 – 3.5cm wide. You want your formal belt to discreetly compliment your outfit and play a supporting role to whatever you’re wearing not stealing the show. Make sure your belt and shoes match and stay away from fancy buckles. The strap can be a smooth patent finish or have a subtle pattern such as a leather grain. Leave bold patterns and contrasting stitching for your casual belts. Also, pick your favorite metal finish (gold or silver) and stick with it, including jewelry and watches. Wedding bands are the one exception. Your casual belts is whatever goes best with your casual clothing. The width of you casual belt can be anything, but there are some general guidelines to adhere to. The thinner the pants the thinner the belt, Linen pants look better with a thin belt and rugged jeans look better with a wider belt. 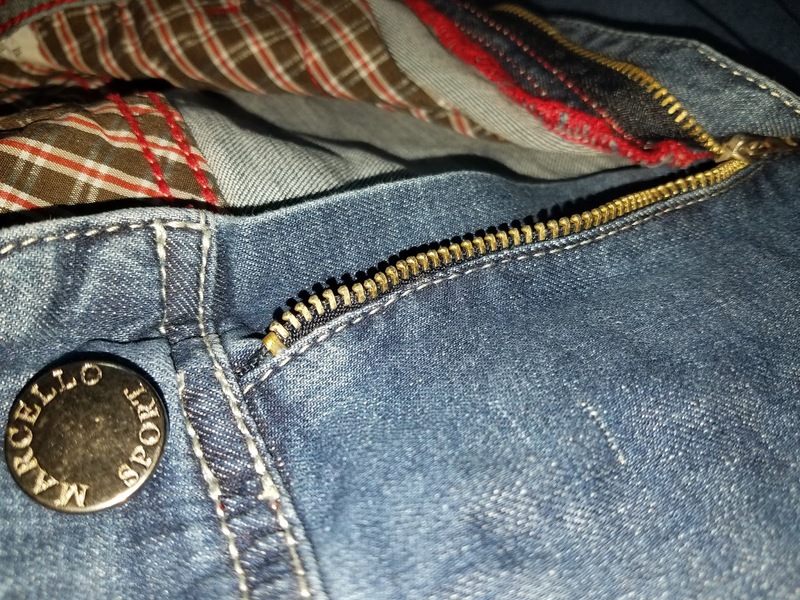 Any belt wider than 4cm requires you to consider if it will pass through the loops on any of your pants or jeans and realize a belt this size is a statement. With a casual belt you don’t really need to match it with anything, but, it is a good idea to avoid matchy-matchy shoe and belt combinations, they may appear contrived. You can have a casual belt intentionally clash with colors for bold effect. There is a huge variety of styles, woven leather, fabric webbing, studded, embroidered, tooled leather, exotic skins, printed and more. The options available to men are so varied, you have no excuse to wear your formal belts with a casual look. It just doesn’t work. There are many exotic leathers, alligator, ostrich, lizard, that can get a bit expensive but tend to last for decades making the investment worthwhile. For the more frugal shopper, you can get the exact same look from embossed leather with the exotic grain at a far lower price point. Your statement belt can be anything you are comfortable with. It could be a handmade belt you received as a gift, a alligator designer style you couldn’t resist or any belt that complements your favorite pair of jeans. Strive to find a statement belt that reflects the statement you want to make and be sure you look for details that make your belt unique and wear it wisely. A statement belt can be just a leather strap with a fantastic belt buckle. There are a huge variety of buckles from the classic cowboy buckles to novelty super hero buckles, just be sure you are comfortable with the statement it is making. 2) A black, tan or natural leather belt woven, braided or a simple leather strap you’ll wear with jeans. 4) A statement belt. Colored, snakeskin, beaded, studded, metal chain – this is the belt that you will use to mark yourself out from the crowd and has the potential to become your signature piece. 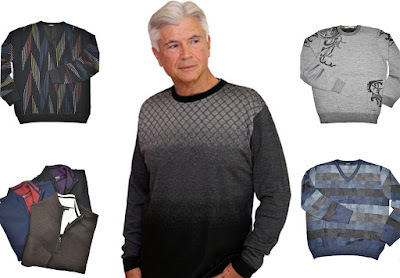 We have just listed a fantastic array of new items with an impressive selection of uncommon and unique sweater designs for men. A quality sweater that properly fits is one of the most flattering garments a man can wear. It adds weight to a skinny physique and streamlines a large figure. Functionally, it keeps you warm while style wise it can break up the monotonous wearing of dress shirts and slacks to the office. There are all sorts of colors and patterns to choose from and for most men having a couple of solid color sweaters is essential, black, blue, white, colors that will go well with lot's of things. A pattern sweater is the opportunity to express your individuality, find one you love and make it yours. Then there are sweaters that are a statement, there are so many choices from military designs to crazy Christmas sweaters. A fine lightweight sweater is perfect for layering your clothing in order to regulate temperature, worn alone, with an undershirt, with a dress shirt or under a sport coat a fashionable sweater will keep you in style. Winter sweaters for warmth tend to be very warm and may not be comfortable indoors. Layering takes planning, think about where you are going and how cold you think it will be. It is strongly suggested to under estimate the temperature because you can always remove a layer. Also keep in mind the level of "dressyness", you do not want to look sharp and take off one layer to then be a slob. 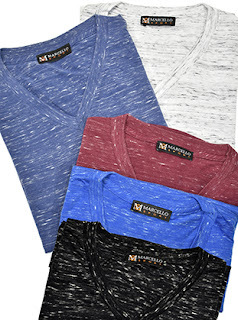 From Marcello Sport we have a luxurious Geometric Crew Neck, lightweight and cool, geometric styling with uniquely engineered knitting. Just a beautiful sweater loaded with nice details! Pair with any color pant. Lightweight and cool, geometric styling with uniquely engineered knitting. Just a beautiful sweater loaded with nice details! Pair with any color pant. Imported, classic fit. European soft long staple cotton. 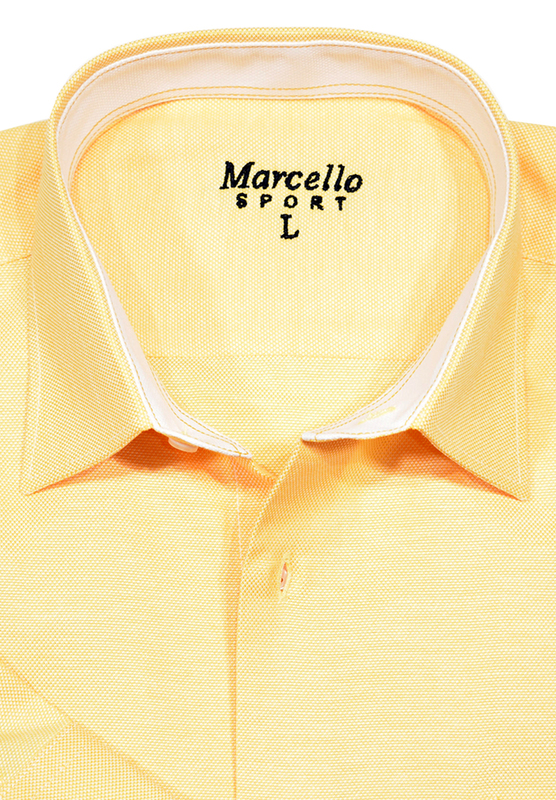 Marcello Sport now has their classic designs in bright new summer colors just in time for the summer season. 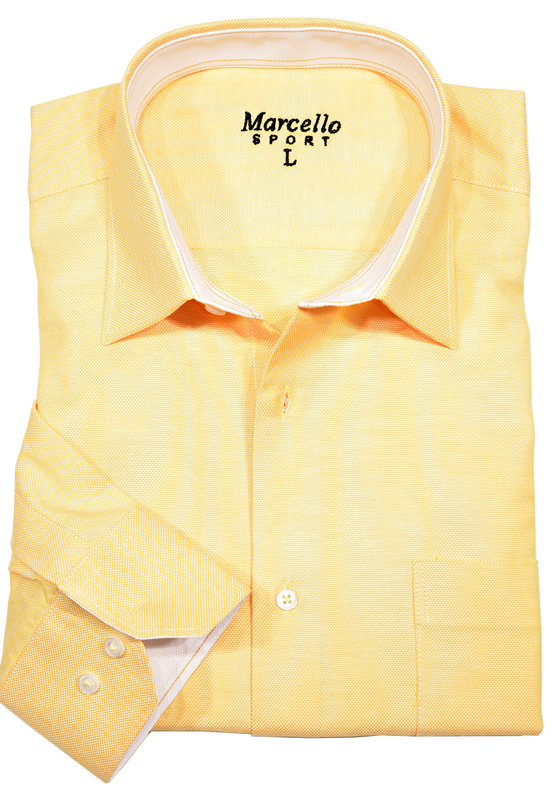 Anyone who is familiar with the classic Marcello Sport shirts knows the fit and quality is unsurpassed and with their addition of new bright colors this summer you can wear them to work and seamlessly transition to a summer event with style. We love the colors and the style is a perfect balance of business casual and summer colors that will remove the need to go home and change after work before going to a summer event without looking over dressed. Many men have a habit in the summer of dressing well for work and then dressing way down after work to go out. Just because it warm out does not mean that a man's old summer shirt and ripped shorts look any better. In order to maximize your fun time this summer, a great summer shirt can save you a trip home to change before heading out. Also, these shirts have all the hallmarks of style and quality for you to be confident that you look great and will be dressed appropriately no matter where your night leads. The accent fabric on the cuffs look great when flipped back for a more casual look and laid back sleeves rolled up comfort. These are some very versatile shirts that look great when worn tucked or untucked, buttoned to the top or loosely buttoned, with khakis or with jeans. They also are well suited to be worn with the sleeves rolled up with a pair of nice shorts. For the more reserved there are soft pastel colors, for the adventurous there are bold red stripes with contrasting collar and cuffs. 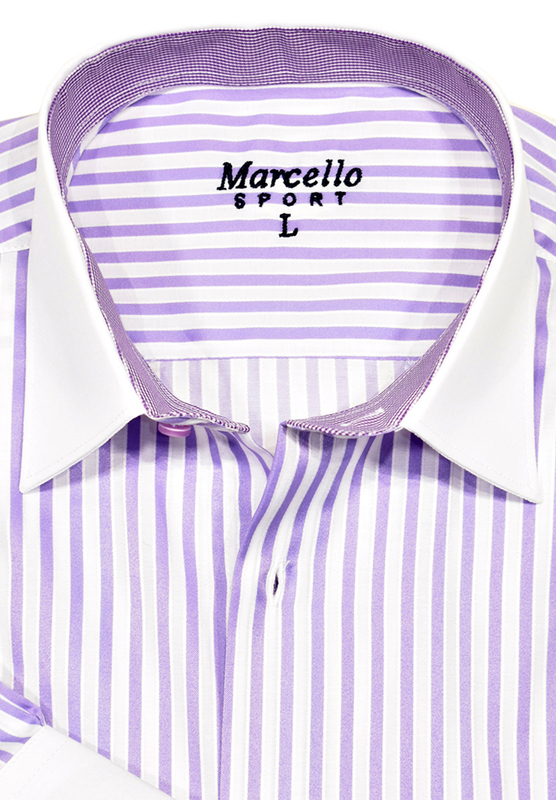 The Marcello Sport Accent in lilac is a great example of the fine quality and attention to detail that will bring your style to the next level. Notice the accent fabric that is not only on the inside of the collar and cuffs, but also peeks out at the Marcello Sport Signature V-cut cuff. 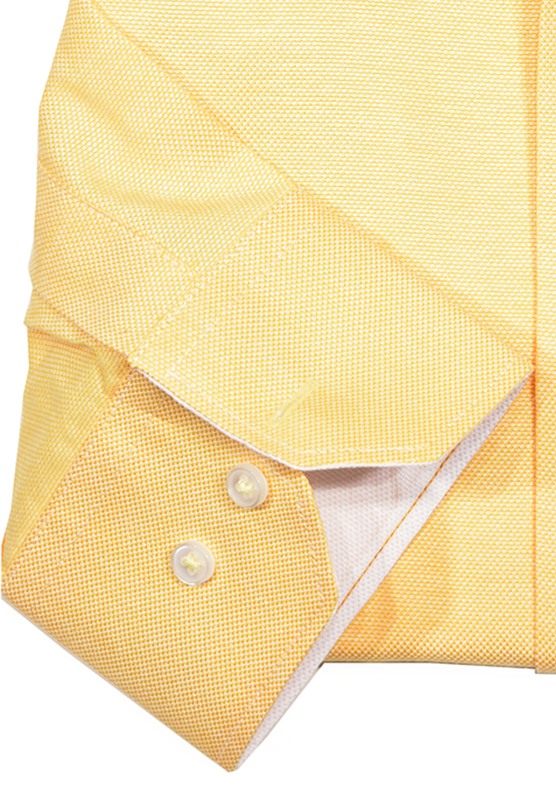 The perfectly matching custom buttons is another detail that sets this shirt apart. Summer styles can be more than comfortable with quality designs in great summer colors that will keep you looking great no matter if you are at a cookout, dining out, attending an outdoor event or going dancing. With great style comes great confidence. Every Spring as I transition to wearing summer clothes, my spouse inevitably says "Are you really going to wear that again?" and I think "of course I am", then I look a little closer and realize some of my favorite summer items did not survive last summer very well. 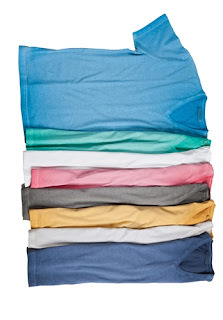 There are more options for men today than the basic tee shirts and polo shirts. I strongly suggest all men think seriously about a well made men's linen shirt for this summer. The one downfall of a linen shirt and the reason many men shy away from it is because of its likeliness to wrinkle. When is hot out, wrinkles are your best friend. When your clothes wrinkle it creates little pockets of air so less fabric is directly touching your skin. Less fabric on your skin means less heat your body has to deal with. Linen is basically old school air conditioning. The main benefit of wearing a linen shirt in hot weather is the coolness and sun protection it will provide. The loose weave allows more airflow and the structure of the fibers allows it to stays away from your skin allowing better airflow over your body. Linen is a “stiff” fabric and is less likely to cling to the skin allowing it wick moisture and quickly dry out and becomes cool again. Linen is highly absorbent and a good conductor of heat. Your linen shirt will feel cool to the touch and is capable of absorbing moisture and then and quickly yielding it again. Because of its molecular structure linen cloth can absorb as much as 1/5 of its weight before giving a feeling of being damp or wet. Basically, your linen shirt will absorb lots of perspiration and it is unlikely it will ever feel clammy. Water is both absorbed and evaporated quickly. The result is your linen shirt acting like an excellent cooling system. Apart from coolness and high absorbency, linen has another very favorable property, good heat conductivity characteristics. Heat conductivity refers to the extent to which heat can be conveyed through the fabric. As linen quickly allows the heat to escape, it further improves cooling. The heat conductivity of linen is about five times higher than wool and eighteen times higher than silk. If you have never owned a great linen shirt, get one for this summer. You can feel cool and look great and as an extra bonus, if you get a sun burn linen will help with keeping the burn cool. We are begining to add video on Justin-Harvey.com to give people a better idea of the amazing men's clothing. Here are a few short videos showing Marcello Sport shirts and a Marcello unconstructed sport jacket. Wearing a sports coat with jeans has been a fashion for a long time, but having a sports coat designed specifically to be worn with jeans is where Marcello Sport has perfected the look. The engineered pattern of this shirt refers to the gradient of stars at the top fading to pure white toward the bottom of the shirt. One of the most unique patterns we've seen. 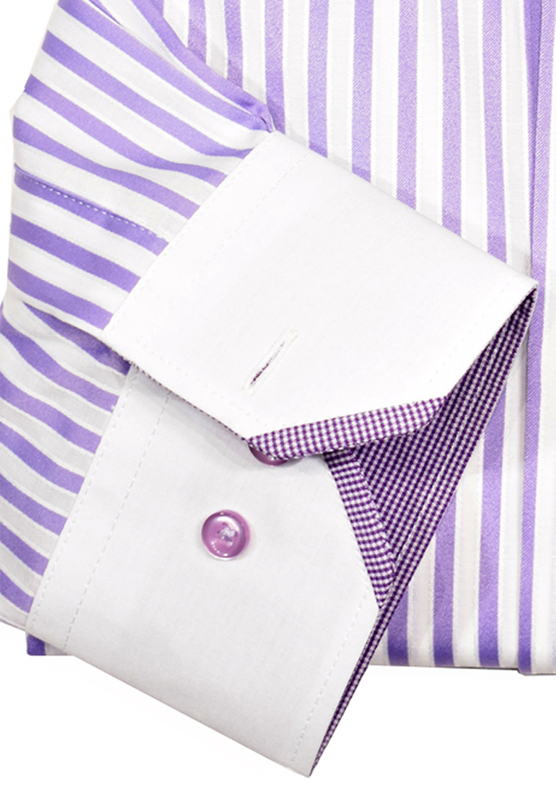 No pocket, classic fit, double button adjustable cuffs with contrasting inner collar and cuffs. Jewel toned, painted geometric pattern. Unique and sophisticated. Double track stitching, custom buttons, medium spread collar, classic fit. This a very cool shirt with bright colors and a great pattern. 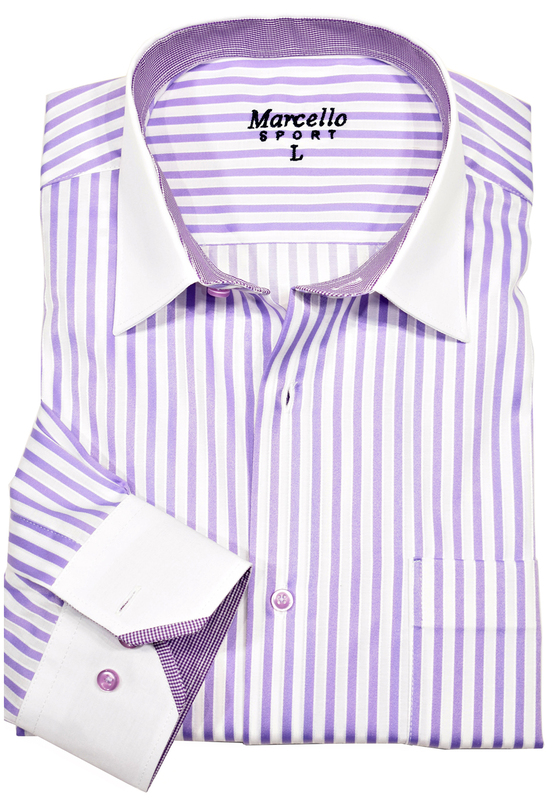 This Marcello Sport shirt is a great example of why Marcello Sport is known for exemplary style that can not be matched. The check pattern alone has fine detailing and unique color transitions, but with the addition of the jacquard paisley this shirt is simultaneously classy, cool and casual. A beautiful mix of bold checks with a subtle jacquard paisley background. Shirt has no pocket, double button adjustable cuffs and spread collar. 100% cotton. We at Justin Harvey have been saying for decades that dressing well not only makes a man feel better and other people notice. Recently Dae-Young Kim, an associate professor of hospitality management in the MU College of Agriculture, Food and Natural Resources, and his doctoral student, Kathleen Kim, have found that restaurant servers often use stereotypes to determine which customers will leave better tips. In their survey of 222 current and former restaurant servers, they found that regardless of race, well-dressed men were identified as more likely to leave good tips, while casually dressed men were seen as the least likely of any group to leave good tips. Most Justin Harvey customers already knew this intuitively, but now there is a study that proves it. Dressing well has so many benefits, feeling better about yourself, being more attractive and now better service at restaurants! For any man going out, looking your best for your wife or date is important but the benefit of better service at dinner not only is good for himself but also boosts his appearance to those he is dining with. Test it for yourself, go out to a favorite restaurant wearing an outfit consisting of items that you think don't look good and are very casual and pay attention to the way the staff respond to you. Does the hostess smile at you and immediately? Is the waiter/waitress attentive and friendly. Listen to the words they use when speaking to you and their body language. The next night go to the same restaurant wearing an outfit that you really look good in, more dressy than casual, and see what happens. Many years ago we did a similar exercise at stores and found that being better dressed caused the staff to be more attentive. We also found that the more expensive the store the more noticeably the staff were more attentive. The reason behind this phenomenon is pretty simple, a sales person in a store or a waitress/waiter has limited time and energy and are trying to maximize their return on spending that time and energy. A well dressed man is assumed to be a bigger tipper at dinner and bigger spender in a store. A good rule of thumb when choosing an outfit is "It's better to be the best dressed man in the room than the worst". Of course a man should wear jeans and a tee shirt to a cookout, but they don't have to be your old ripped jeans and faded "I'm With Stupid" tee shirt. A crisp pair of lightweight jeans and a designer tee shirt are just as comfortable and look far better. With Spring in the air and summer around the corner, a great pair of light weight jeans can keep a man comfortable and looking great without burning up in the heat. Justin Harvey has made lightweight jeans that are a game changer, the Marcello Sport LP2000 Denim Jeans. All men love jeans. Jeans are a staple of every man’s wardrobe, we will wear them with almost anything and they look good. In the summer many traditional jeans are a bit hot, but men wear them anyway. Today there are lots of jeans that are labeled “lightweight” and for the most part they are lighter in weight than traditional jeans, but that does not necessarily mean the jeans are not as hot on your skin because often the lightweight denim has too much synthetic fabrics mixed into the cotton to reduce weight and give some stretch and makes the denim hold more heat. Marcello’s goal was to create light weight jeans that look traditional, feel like jeans and fit men comfortably. They dissected what goes into a good fitting pair of jeans: the fabric content, the fabric weight, the leg sizing, the waist sizing, the front rise, the back rise, the inseam, the leg opening, the knee opening etc… to come up with a the LP2000 jeans. The design experts at Marcello Sport identified the ideal lightweight denim weight. Denim is measured in ounces, like most textiles used in clothing. It’s usually much heavier than wool or finer cotton weaves. That gives it sturdiness, but also makes it warmer in the summer. Traditional denim jeans use cloth that weighs between 8 and 13 ounces per yard. That’s thick enough to be tough, but not too stiff. Anything above 16 oz. is getting into one of two niche markets: truly rugged work-wear for men who punish their jeans severely, and monstrously thick “raw denim” designed to fade and crease in dramatic patterns. You don’t want to wear either of them in hot weather if you can help it. Marcello LP2000 jeans weigh just 6 - 8 ounces per yard, 30%-40% lighter than traditional jeans, and actually feel better than some khakis and chinos in the summer. Trousers in a very tight cotton weave can actually be more stifling than jeans made from denim an ounce or two heavier, simply because of the airflow. Denim is a fairly breathable weave. 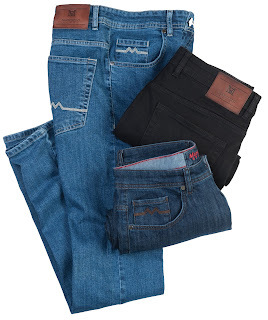 Most men want a bit of stretch in the jeans without sacrificing the look and feel of denim. In order to achieve this the LP2000 jeans are 98% cotton with 2% Lycra, just enough to give a bit of stretch and allow the cotton to breath and still have all the character of a heavier material. The bit of stretch makes the LP2000 jeans incredibly comfortable for men of varying shapes and sizes. When the LP2000 first arrived at Justin Harvey we were impressed. We decided to give the jeans to our employees at Justin Harvey in order to get first hand opinions and the response was a resounding “Best jeans ever!”. Even our most difficult to fit individuals were impressed that the jeans actually fit them comfortably and looked great. "Wow, I've never had jeans fit this well"
"These fit perfect and are so lightweight, can I keep them?" "Why aren't all jeans this comfortable?" Now that the weather is getting warmer it’s time to try a pair of lightweight jeans to experience the difference. We have many customers that try the Marcello LP2000 as summer jeans and come back to buy every color and wear them all year round. Marcello Sport has taken their obsession with great quality and design and produced the best men’s lightweight jeans with the perfect fit. Available in Denim, Navy and Black.